Do you own a home or business in or near Modesto? Do you want to reduce or eliminate your utility bills? West Coast Solar encourages you to make the switch to solar power. 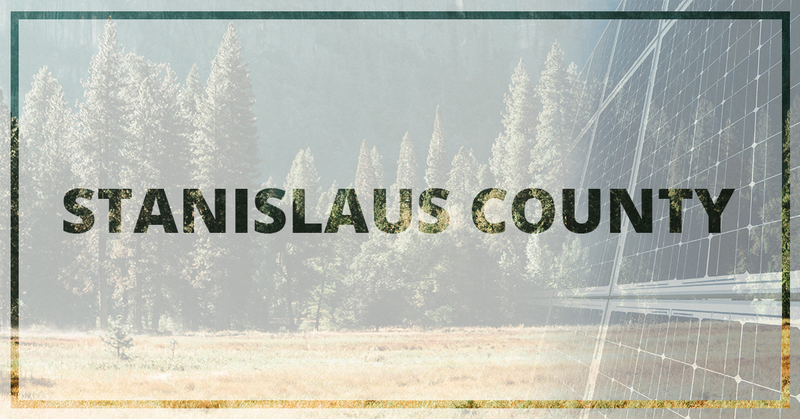 We offer solar design and installation to our Stanislaus County residents and businesses so they can save money and help the environment at the same time. As a homeowner or business owner, a solar power system will help you save money, make a positive impact on the environment, and increase your energy independence. When you make the switch to solar power, you will also be able to take advantage of the Solar Investment Tax Credit (ITC) until 2021, which offers up to a 30 percent tax credit for your solar system installation. Also, at West Coast Solar, we offer a number of financial options to choose from so you can get the best solar system for your energy needs. When you work with West Coast Solar, you get an expert designer, certified solar installation technicians, and the best solar hardware the industry can offer. We encourage you to utilize green energy, whether you want to save money on utility bills or help reduce carbon emissions. Your home’s energy efficiency can be supplemented and improved when you switch to solar power. Do you run a business in Stanislaus County? Do you dread watching your utility bill costs rise every month? West Coast Solar has a solution for you: a solar power system. When you make the switch to solar power, you will save money, help the environment, and increase the value of your brand. Ready to get started? Give us a call today! A solar power system for your home or business in Stanislaus County will save you money on your utility bills, reducing your annual energy costs, and nearly eliminate your carbon-emissions, helping the environment. If you’re ready to make the switch to solar power, give West Coast Solar a call today!